We are forever connected to the memory and cellular intelligence of our ancestors. Honoring the Ancestors unearths past traumas and hurt carried through family lines. Many people go through life carrying their ancestor’s burdens on their back without realizing it. We recognize ancestral traumas prevent us from continuing in our own life because ancestral memory is embedded in our vital tissues. The challenging karmic ties are re-enacted as self-defeating patterns, personal despair and challenges in our own lives. Kindness and love toward our ancestors release the karmic ties of our past. When the autumnal leaves begin to fall we hear the rustling voices of our ancestors calling us to remember them. At this junction of the year we celebrate the universal time of the ancestor we take time to remember our loved ones. In so doing, their journey in the etheric field is supported, strengthening love, joy and abundance in our lives. Honoring our Ancestors strengthens our soul’s vision and the contractual bonds we made before birth. Embrace each and every one of your ancestors, departed teachers and guides in the divinity of spirit. Practice ahimsa as you feed, nourish and comfort their souls. Sustain the unbroken grace that flows from generation to generation. Release worn out negative memories and unproductive ancestral patterns so you can own your personal freedom- the freedom to live, love and prosper! We are now approaching the auspicious season of the ancestors. Each year, during the dark fortnight and starting at the autumnal full moon (September-October) of the Hindu calendar, comes 15 days of premium time for honoring and nourishing the ancestors. This powerful ahimsa practice for the ancestors is followed by nine days of celebrating the Divine Mother. Timeless millennia of unbroken practice in the Hindu tradition informs us that this is the perfect time to identify and release ancestral memories, and break the blueprint of illness, unhappiness and habitual patterns and reclaim your happiness, health and well-being. 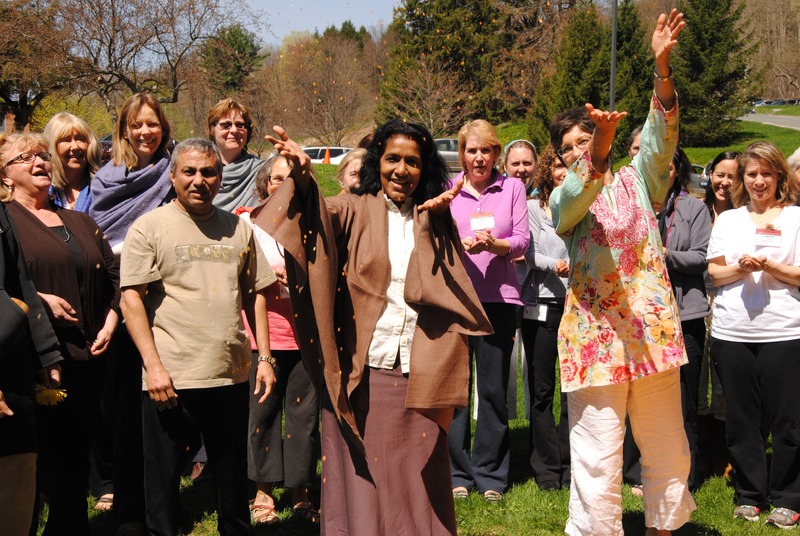 Come Join Maya Tiwari in Honor the Ancestors Event on September 27-29, 2013 at Kripalu Center in Lenox, Mass. Invoke your ahimsa psyche, release ancestral baggage and hurt, and reclaim your freedom during this healing weekend. Begin now by taking the Vow of Ahimsa to heal yourself and the unbroken chain of your ancestry, known or unknown. As you access your ancestral memory, your obstacles will dissolve into joy, healing, and winged spirit. Seize the opportunity to reclaim your freedom from ancestral baggage and reclaim the blessing and gifts of your ancestors. May Celestial Grace guide me to nourish, honor and my ancestors. May I strengthen inner harmony in thought, speech and action.